This is it the final section, the road to JOG we had an excellent breakfast, despite watching it hailstone outside. But by the time we were ready to saddle up and ride it had dried out even though it was overcast. A downhill start down to the main road with the blind sheep dog chasing Colin, nothing changes. We had a climb out of Melvich but after that Mrs Ritchie at Tigh na Clash said it was flat all the way, she was right. Well a couple of climbs. It was steady climb and then a nice rundown into Reay village this village literally has a golf course running right through the middle of it, many of the cottages backing straight onto the course. The most Northerly course on mainland Britain. 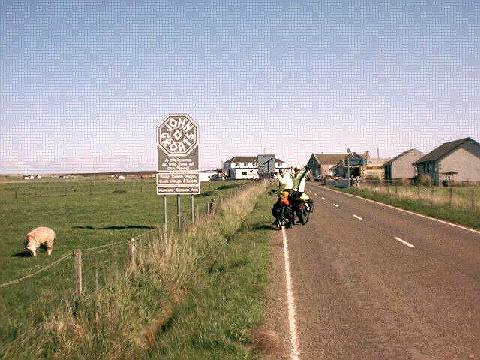 We joined a back road out of Reay which held some slight undulations, but we were making good progress the countryside was flattening out; we eventually made Thurso, the council estate by the sea. Yes nothing much to commend it. The town centre was quiet apart from a couple lunatics wandering around ala Redruth, one was a wandering minstrel overweight, long died blonde hair who was rambling and talking to himself, another shouting abuse at everyone then went into Mackays dept store. At least we found cash machines, we also sat in the town and drank tea and ate scotch pies watching the world go by, when we eventually were served service was very slow but the food was good. A climb out of Thurso it was our last lance corporal after negotiating a few corporals yesterday it seemed flat, the long climb out of Thurso with the sun shining gave us wonderful views over the Dunnett head and the Orkney Islands. Then a long run down to Castletown the home of the Flagstone Industry which made Caithness famous the old harbour and buildings are still there. At one time in the 19th century the Flags were shipped all over the world, apparently most the old streets of London are paved with Caithness Stone. 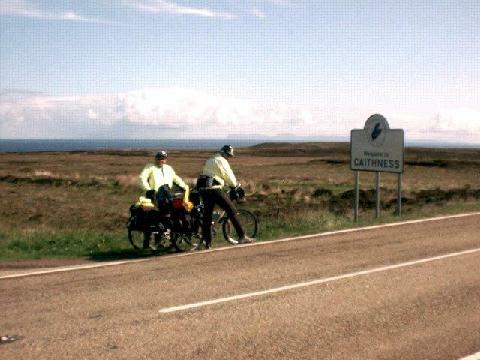 As we left Castletown the road was flat the wind was at our backs and the sun was shining, as we made towards JOG. We had left the car at Ben Corragh Caningsby and as we passed the road end Colin did a quick detour and returned with a package, all was too revealed shortly. we,d completed the task but it was the end,I thought of the changes to our lives this last 4 years, especially to Jane as I know full well had she still been around she would have been at JOG to meet us, she was that type of person. Then it was downhill to JOG, we arrived at 315pm 21st May. Stopped at the Village sign and then the famous signpost, it was quiet so we celebrated as Colin produced three engraved trophies, a bottle of Champagne and 3 Champagne flutes. We had fun drinking and toasting our success. 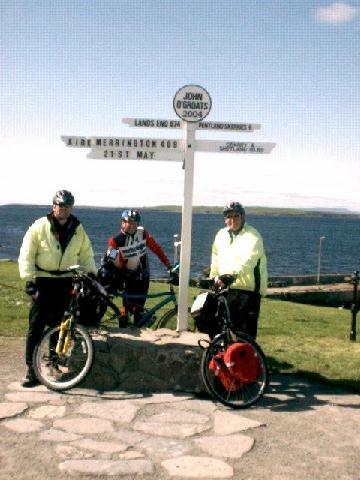 The JOG signpost photographer recorded the moment with Kirk Merrington 409 miles. It was the photographer’s first day on the job so we were worried as to how the photo came out, but it is fine. That was it JOB DONE 183 miles from Inverness. Champagne followed by a beer in the Groats inn, Colin trying to ride backwards over the finish line and landing in a pile!! Then it was back to earth, we bought postcards and souvenirs plus we then had to cycle the 5 miles uphill into the wind back to the B and B. Where we had a comfortable room with a sea view of the Isle of Stroma and some entertainment with Ron our landlord. Who became a big pal of Colin’s for various reasons. That night it was a mini celebration driving down to Wick to have Fish and Chips and a couple more beers in Groats Inn JOG. Then the long drive home via the Crask Inn on the Saturday, finishing off with a big celebration meal in Pinhall Inn Stirling an excellent night. All in all JOB DONE next year it’s rumoured the Multidaymen are going International. 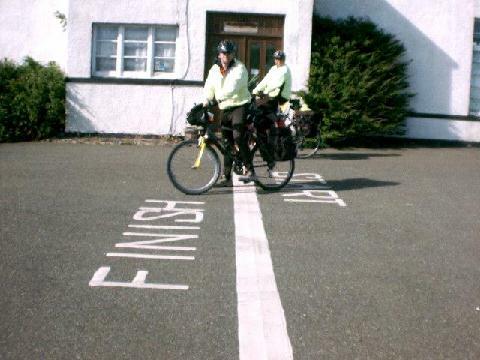 Now all it takes is to summarise both the entire End to End trip facts figures etc plus the 2004 Inverness to JOG leg.